Singaporean artist and filmmaker, Ho Tzu Nyen, is not a newcomer to the international exhibition circuit. His first feature film, HERE, screened at the Cannes Film Festival in 2009 and his artworks which bring together sculpture, painting, filmmaking, performance and music, have been shown at international exhibitions and biennales over the past decade. This year the artist is holding his first major exhibition in Sydney at Artspace in Woolloomooloo as part of the 2011 Sydney Festival. 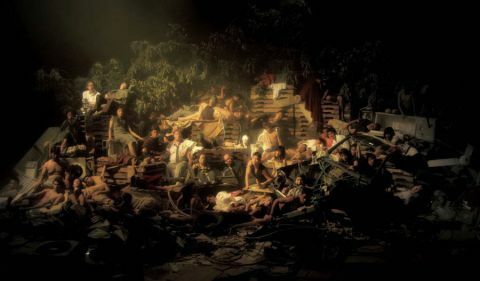 The exhibition, titled Earth, takes the name of one of three major videos on show and is characterised by Ho Tzu Nyen’s mastery of moving image works based on biographical and philosophical narratives that are visually both poetic and visceral. Projected at cinematic scale in the gallery, and 42 minutes long, Earth unfolded at a painstaking pace as the camera moved with measured precision across a theatrically choreographed scene, revealing frame by frame the detail of a post-apocalyptic landscape. Amidst timber and industrial detritus and overhanging clumps of vegetation, the limbs of prostrate human figures came into view, caught in the hiatus following an unknown natural or manmade disaster, seemingly in various states of unconsciousness, sleep or death. Bathed in a surreal light, suggestive of dawn, and accompanied by a soundtrack of synthesised guitar music, the event portrayed seemed nothing short of the end of life on earth. The artist has spoken of the influence of European painters and there is a definite resonance between Earth and the painting, The Raft of the Medusa, by French artist, Théodore Géricault. Géricault depicts the moments between life and death for fifteen survivors of the French ship, Méduse, shipwrecked off the West African coast in 1816, as they lie sprawled across a hastily made timber raft drifting aimlessly in a tempestuous sea. Despite the impression of watching a video of a painting, the artist was emphatic that the slight movements which occur during the 42 minute film are crucial. A more conventional narrative was evident in the video, Zarathustra: A Film for Everyone and No-one, which was the culmination of a course the artist conducted with students of film, musical theatre, acting, fine arts and music at LASALLE College of the Arts in Singapore. Based on the philosophical novel, Thus Spoke Zarathustra: A Book for All and None, by German philosopher, Friedrich Nietzsche, the video explores the journey of the protagonist, a black caped Zarathustra, who descends to earth from a tower like construction (alluding to mountainous reclusion) and moves slowly and awkwardly through a shadowy landscape of discarded books, sheets of plastic and cardboard boxes. After delivering his message to people earth bound that ‘man is something that is to be surpassed’, he leaves his followers and climbs laboriously back to the freedom of the mountain. It is a compelling narrative about the human struggle for self-mastery and will to overcome the environment. It is also the struggle of pedagogy and creativity. Moving from philosophy to science, Newton was the third video on show. It offered a highly abbreviated, quirky and anecdotal biography of Sir Isaac Newton, the pioneering seventeenth century English physicist, mathematician and astronomer. The work was obsessively repetitive and mesmerising, embodying references to Newton’s Law of Universal Gravitation and Laws of Motion, which include his theories that for every action there is an equal and opposite reaction, and that an applied force on an object equals the rate of change of its momentum with time. Clearly, Ho Tzu Nyen is inspired by formal questions as an artist, but I was interested in the relationship between these works and the Singaporean context. At one level, the Buddhist belief in the cycle of suffering and rebirth can be seen in certain scenes and narratives, as well as the cyclical, non-linear form of his videos, where a sequence of images continually loops, with the last frame the same as the first. Ho Tzu Nyen is currently editing his second feature film and planning a solo exhibition to open at the Mori Art Museum in Tokyo on 26 November. Catherine Wilson, BFA(Hons), Dip World Art, is a freelance writer and editor currently based in Sydney and working freelance in South East Asia. She has written news, features, opinion and travel articles for The Brunei Times in Brunei, The Jakarta Post in Indonesia, Asia Sentinel in Hong Kong, SolomonÂ Star in the Solomon Islands, London Progressive Journal in London and Crikey, source of independent journalism and news in Australia. Catherine has also written extensively about contemporary visual art, world art, culture and society for a-n Magazine and The Oxford Times newspaper in the United Kingdom, Artlink, Art & Australia and Art Asia Pacific in the Asia Pacific region and contributed essays to museum and gallery publications. In 2010, she held the position of Features Editor at The Brunei Times newspaper, based in Bandar Seri Begawan, Brunei Darussalam.